General Formulations® 208 is a 7.0 mil premium white highly plasticized flexible calendered vinyl film laminated to a 90# lay flat liner. 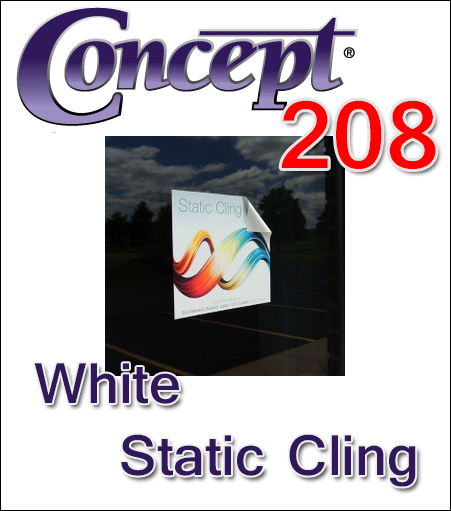 Concept® 208 is designed for window decals, temporary product markings, point of purchase displays and protective masking. This static cling vinyl is designed for temporary application to glass. It may also function adequately on other smooth, clean surfaces such as metal and plastics. Thoroughly test this product when applying to painted surfaces. Hazing may develop on the painted surface with extended exposure to static cling vinyl. Designed for window decals, temporary product markings, point of purchase displays and protective masking.